ANIMAL PRINT and PEONY DOOR STOP This item is on sale. If your house is as off-plumb as mine, this door stop is less of a luxury than a necessity. Sides of brick are very complimentary with today's hardwood floors. Top is very traditional against a dark background. Priced to sell fast! Vintage Libby Sturdy Designs, Limited quantities. When they're gone, they're gone. Shop quickly! CS-GIRL DECORATING TREE This item is on sale. 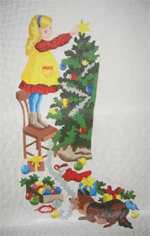 On #18 canvas, this darling little girl and her puppy are trimming the tree. Isn't there a little girl in your life who has just the same amount of initiative and creativity? I bet so!! No little boy decorating tree available. 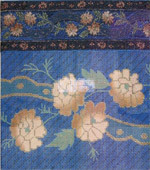 Size: About 10 x 22." Room for monogrammed cuff. 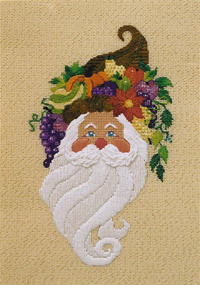 CS-GIRL WATCHING SANTA IN SKY This item is on sale. This little girl in her pink striped Dr. Denton's is sitting on her toy box with her dog watching Santa as he speeds through the night time sky delivering toys to all good little girls ad boys. #13-14 canvas. Ample room for monogrammed cuff. CS-MALLARD AMG CATTAILS MINI This item is on sale. Got a sportsman on your agenda? Perhaps a member of Ducks Unlimited? 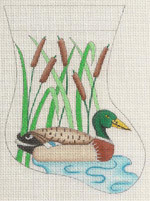 Why not a perfect open-ended mini sock ornament, filled with duck "stuff?" A perfect gift for that someone who is difficult to buy for. Jingle Bell Ornament with Santa This item is on sale. Jingle Bell Ornament with Gingerbread Man This item is on sale. 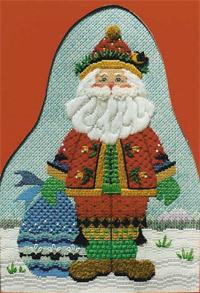 Jingle Bell Ornament with Patriotic Santa This item is on sale. Jingle Bell Ornament with Snowman This item is on sale. 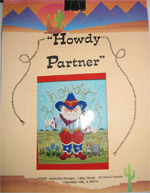 JUST LIBBY - HOWDY PARTNER This item is on sale. 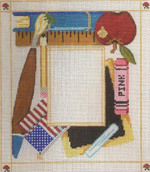 13-1/2" x 15" charted design by Just Libby Designs on #18 canvas. Materials list = floss, perle, fine wool, overdyed floss, braid and specialty threads. 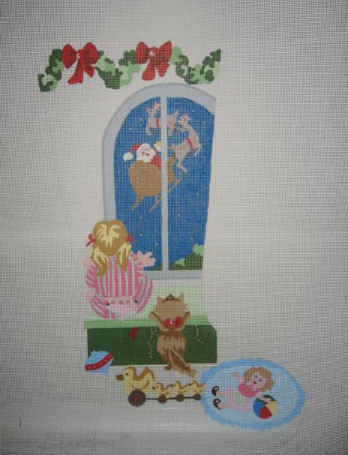 All stitches called for are graphically diagrammed, superbly explained, and areas to be stitched beautifully llustrated. There's no room for misinterpretation. KIMONO This item is on sale. This is an exquisite charted project utilizing over 90 stitches, 4 dozen skeins of cotton or silk floss, 18 count or smaller canvas, and a long winter's night! For the medium-advanced and advanced stitcher simply because it requires compensation and techniques not normally used in beginning pieces. It is breathtaking and an heirloom! When completed you will feel a real sense of achievement and you will definitely be an accomplished stitcher! Don't be timid! 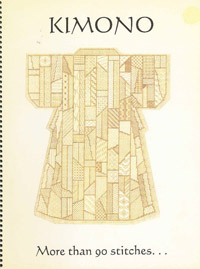 PATCHWORK MINI CS This item is on sale. 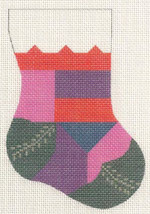 this little mini sock can be stitched as elaborately or as simple as you choose, depending on your selection of threads from your stash and your choice of stitches. Plenty of room for a monogrammed cuff or embellish further with a scrap of Battenburg lace. Challenge your creativity! On #18 canvas, by Danae, delicate picture frame for newborn baby. Outside measurements = 6-3/4" x 8". Inside = 3-1/2" x 4-3/4. PICTURE FRAME - SCHOOL DAYS This item is on sale. What favorite teacher wouldn't want to receive this picture frame, on #18 canvas, with her (or her student's) flick in the middle which = 2-1/2 x 3-1/2" and a perimeter of 6-1/2 x 7-1/2"? None of my teachers ever wanted to see me again, but you or yours, I'm sure they would! PURSE - BUTTERCUP This item is on sale. If you think midnight blue is the new black, then this very sophisticated purse is perfect for you. 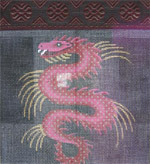 See further description of the Dragon Purse. PURSE - DRAGON This item is on sale. An absolutely stunning evening purse to wear to the symphony or to your many holiday parties. Shoulder strap can be your collection of beads and oriental coins and talismen. A very sophisticated accessory enhanced by the border ribbon across the top edge. Drop dead exquisite. SAYINGS - AMERICANS This item is on sale. In the light of all the current negative publicity, sometimes we believe it! This little quip should enlighten us that we're not all a bad bunch of folks! On #18 mesh. 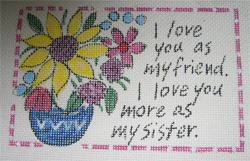 Size: About 7" x 4-1/2"
SAYINGS - SISTER This item is on sale. Just a word to the wise...Don't make the mistake I did in never stitching this for my sister as a love gift. For me it's too late...don't miss this chance to tell your sister how much she means to you. On #18 mesh. SEASHELL LUGGAGE STRAPS - A This item is on sale. A set of 3 on #14 canvas, this is one of 3 straps to be corded and lined in a coordinating moire and attached to a white, off-white or fruitwood luggage rack, in a home in the Caribbean, Gulf or either oceans. And yours would be much more welcoming than those found in even the highest end hotels. Make your guests feel extraordinarily pampered and you can at this price of all 3 straps for $80.95! Size: Standard luggage rack size - 3" x 21"
SEASHELL LUGGAGE STRAPS - B This item is on sale. #2 of 3 straps. See description for #04297. SEASHELL LUGGAGE STRAPS - C This item is on sale. #3 of 3 straps. See description for #04297. SLEEPOVER This item is on sale. Do you see yourself? Your teddy bear? Your bowl of popcorn, Your nightie? Your girlfriends watching a scarey show all snuggled together in someone's bed...on a Friday night? What more fun was there then? By Maggie and Co. on #18 canvas. 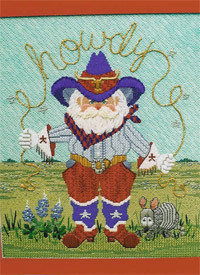 SOUTHWESTERN SANTA This item is on sale. Vintage Libby Sturdy Designs. Limited quantities. When they're gone, they're gone! Shop quickly! STENCILED BUTTERFLY This item is on sale. On #14 canvas, all of these simple depictions painted stencil-like finish as magnificent inserts in black lacquered boxes, especially when the simplicity is embellished with realistic stitches and textured or overdyed threads. 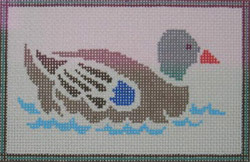 STENCILED FLOATING MALLARD This item is on sale. 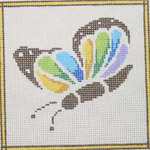 See description of Stenciled Butterfly. STENCILED MAD MALLARD This item is on sale. See description of other stanciled designs. SUNDAY'S CHILD This item is on sale. 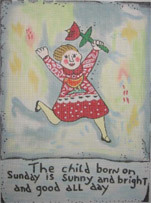 By Maggie and Co. and on #18 canvas, "The Child Born on Sunday is Sunny and Bright and Good All Day." 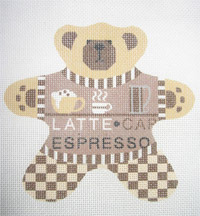 TEDDY BEAR - CAFE OLE This item is on sale. On #18 canvas, this little man exudes a very take-charge personality while perfectly computer stitch "painted." Visualize that face and ears stitched in a very tight turkey work, his paws in tight french knots, both in a gingerbread wool. Pants are in alternating scotch stitch and sweater in a ribbed stitch. What a presence! WHALE of a TALE SANTA This item is on sale. Vintage Libby Sturdy Designs. Very limited quantities. When they're gone, they're gone. ZEBRA ANIMAL PRINT DOOR STOP This item is on sale. Nowhere do you find a ZEBRA print brick door stop!But animal prints are sooooooo utilized in today's interior decor. And like the peony doorstop this will look FABULOUS against today's hard wood floors. Treat yourself to an accessory priced to sell!